Torremolinos is one of the most popular and good value for money tourist destinations on the Costa del Sol. The resort is less than fifteen minutes away by car from Malaga Airport and Gibraltar Airport approximately a ninety minute drive away provides a further gateway to the Costa del Sol and Torremolinos. Getting from Malaga International Airport to Torremolinos is a breeze especially if you are not interested in renting a car. There are regular bus and train services between the resort and the airport costing as little as €1.55 one way. Torremolinos is the closest major tourist resort to Malaga International Airport. Torremolinos beaches are well equipped and cleaned daily and the best beaches include La Carihuela, Bajondillo Beach, Montemar, Los Alamos, Saltillo Beach and the Costa Lago Beach. Because of the great climate the Costa del Sol enjoys, golf is something to do all year round and there are an abundance of golf courses in the area. Golf courses closest to Torremolinos includes the Golf Torrequebrada and Benalmadena Golf. Accommodation can be booked in hotels, villas and apartments many of which are within easy walking distance to the beaches. Torremolinos attracts large numbers of tourists annually especially families with children on a budget. Popular hotel complexes to choose from if contemplating a vacation in Torremolinos include the Hotel Luna Blanca, Hotel Don Paquito, Hotel Isabel and the Hotel Cabello. Many families with children prefer apartments to hotel rooms because of the extra space and the added bonus of having a lounge and kitchenette at their disposal. 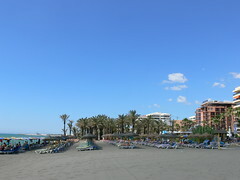 Favoured apartment complexes in Torremolinos that have received good reviews include the Apartamentos Bajondillo, Torre de la Roca and the Playa Miguel Beach Club. The Playa Miguel Beach Club is worth a visit if you want to experience the beach club culture of the Costa del Sol but don’t want to spend large amounts of money such as Nikki Beach and the Ocean Club Marbella. For more information on the Playa Miguel Beach Club you can look at http://www.playamiguel.es. Places to eat out at in Torremolinos which have been recommended by the Trip Advisor include Kate’s Cottage, Café Fresco, the Spanish Garden, La Cacerola, Kathmundu Nepali Restaurant, El Sabor, El Gato Lounge, The Carvery, Bistro Europa, Restaurante La Escarela and the Tudor Rose. Torremolinos has a reputation when it comes to its nightlife and what with the ability to be able to walk next door to the neighbouring resort of Benalmadena nightlife enthusiasts are spoilt for choice, nevertheless nights to dance away can be spent at the Passion Discoteca, Palladium, Fun Beach, Alvarete, Pipers, Voltage, Eugenio’s Disco and Piano Bar and the El Gato Lounge. For an authentic flamenco experience you can head out to the Taberna Pepe Lopez which attracts a truly international audience. Popular Torremolinos tourist bars include Shenanigans Irish Bar, Tiki, Lombok Natural Beach Bar, Moliere Playa, La Cervetzateca, Matahambre and the Bar Amsterdam. Torremolinos is also gay friendly resort with many gay bars and discos with a good selection of locales located in the La Nogalera. The Parthenon is open every day of the year and the El Gato Lounge with its large terrace is located in front of the also gay beach of Beirola beach which also goes by the name of the El Gato Beach. Further gay nightlife spots include Boomerang, Esquina Renes Bar, La Palmera, Passion and Morbos. Torremolinos is very popular with British tourists, is a large tourist resort with many high rise buildings and also a large expat population. The best way to see what Torremolinos is like to look at is to have a look at a webcam and then at the same time you can see what fantastic weather the resort enjoys. I think Torremolinos doesn´t exclude anybody to be able to enjoy this lovely place. The foreign population registered in Torremolinos is 26% of about 70,000. Up to 130 nationalities live in this county, of which 75% comes from countries of the European Union, so the 74% of the local population are Spanish. The good thing about this city is that there is always something to do, from concerts to regattas, and of course I love to have a nice walk on the promenade and just sit down in any “chiringuito” and relax. It’s the best time to buy, prices are definitely not going to drop any more. How much are the typical property prices in Torremolinos for apartments, villas etc? There are no typical prices, it all depends in the area, kind of apartment or villa, if it´s refurbished or not…there are so many different areas with different prices. Jessica, thank you so much for taking the time to help our readers with your experiences in Spain. If you want to contact her, you can find her details below. El Gato Lounge, a popular beach terrace is now open 7 days a week, all year around. Free tapas with your beer or wine.